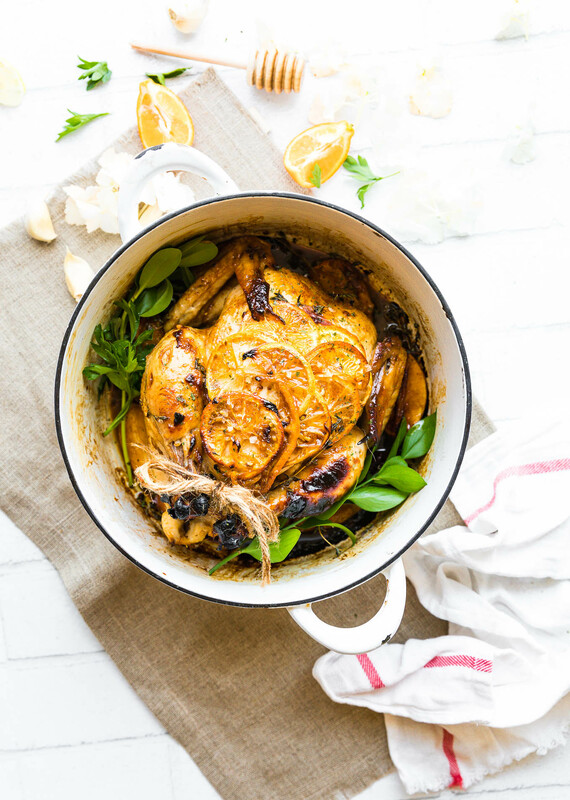 Paleo One-pot Orange Honey Garlic Roasted Chicken. The sweet and savory orange sauces makes this roasted chicken moist and flavorful. Easy to make in the dutch oven (or pan) and a total crowd pleaser for family or holidays! Oh hi. My name is Lindsay and I have a confession. I am way too excited that it’s almost FALL. Que the pumpkin, roasted everything, and change of leaves! Another confession… I am WAY picky when it comes to cooking Chicken or Turkey. GASP! Did I just say that (type that) out loud? Oh, I think I did. Well, it’s out there. And you know what? My kiwi of a husband feels the same way. 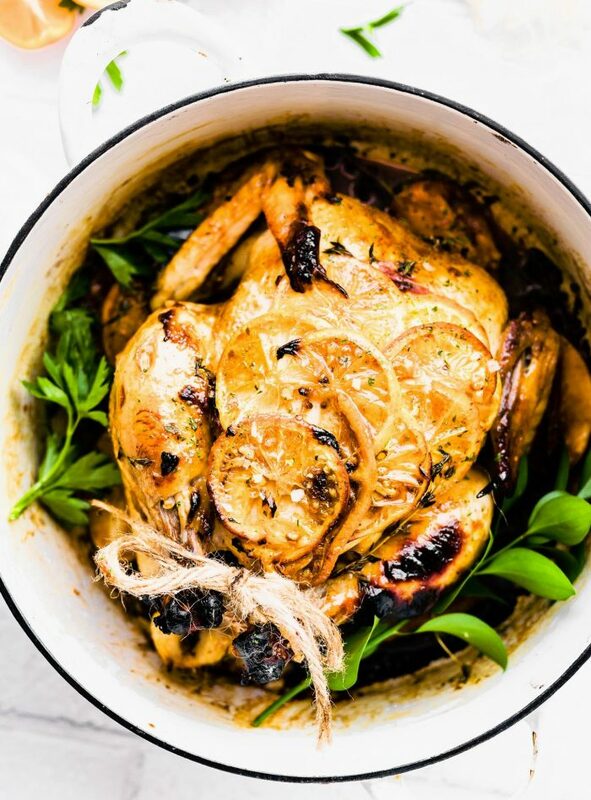 Um, hence this One-Pot (or pan) Honey Orange Garlic Roasted Chicken recipe. FLAVOR is needed!!! You see, it’s not that we don’t like poultry (chicken or turkey), we just prefer it with LOTS of flavor and well… not dry.. but instead, juicy and moist! Are you rolling your eyes at me? It’s okay, i get it. We’re stranger. But I think you’ll prefer my method once we explain. Roasted chicken, like in a cranberry marinade or mixed into miso mango chicken wrap, yes, that DIVINE! That’s our preference. Or Chicken PHO .. OH YO, we likey! And my husband, well, he’s a lamb and beef kind of guy. Plus he has nightmares from turkey leg and pumpkin incident from Thanksgiving a few year back. Needless to say, if he won’t eat pumpkin or turkey anymore. Haha, poor guy. Thanksgiving is not a fond memory of his. That being said, It is almost Fall and the start of Holiday season! I’m not about to break tradition, I just plan on adding to it. Ya know? Like the adding to our mashed potatoes with white bean potato mash, bringing a vegan cranberry lentil loaf, a fall panzanella salad. So heck, let’s just add Honey Garlic Roast chicken to that Holiday table. Or any weeknight table to be exact. I feel like I’m cheating on turkey or ham, but this roasted chicken is so good and easy to make that we’ve been eating it REGULARLY! GASP! It’s a simple, healthy, one pot wonder! Just mix, coat, roast, and BAM! FLAVORFUL Roasted Chicken at your service! In fact, I think even the turkey fans would be impressed. 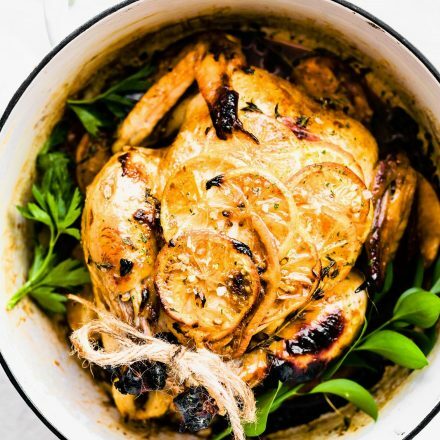 It’s the orange honey garlic sauce that makes this roasted chicken just so tender! Fresh squeezed oranges picked ripe from the vine. And I grew my own garlic! Kidding. But in all seriousness, it’s just real food ingredients that make for the tastiest dishes sometimes, would you agree? It’s healthy, paleo, gluten free, grain free, made with ingredients you probably already have in your pantry… you get my point. It’s what my husband likes to call a “MONEY” dish! 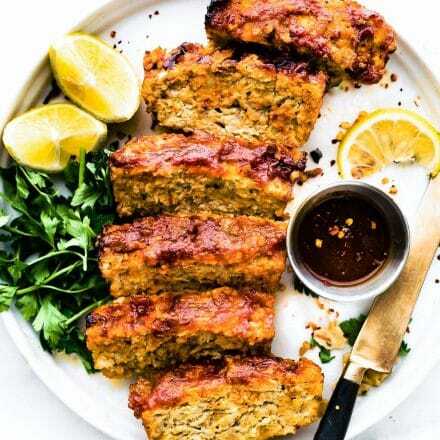 Meaning —> easy to make, budget friendly, great for everyone, delicious, LOVE IT! Okay ya’ll, get your one pot ready for this orange honey roasted chicken! 2 oranges, juiced (or 1/4 c fresh orange juice). Extra sliced oranges for garnishing. Combine your juice, olive, oil, garlic, and honey, balsamic vinegar, and other remaining spices in one small bowl. Mix well. Place oranges around chicken in the dutch oven. Cook on medium heat covered for 25 minutes on stove. While Chicken is on stove, Preheat oven to 450F for later use. After 25 minutes on stove, flip the chicken over, skin side/breast up. Coat the sauce from the pan on top of the breast and around thighs. Add a few garnishes of thyme and orange slices on top of the breast. Transfer the dutch oven pot with chicken into the oven uncovered and cook for another 25-27 minutes or until cooked through and skin is crispy. 165F. Check chicken after 10 minutes in oven, just to be safe. Skin should be crispy on top. Remove and spoon any extra juice from pot and coat it again over chicken. Serve with veggies or salad! See notes if you don’t have a dutch oven or oven safe pot. 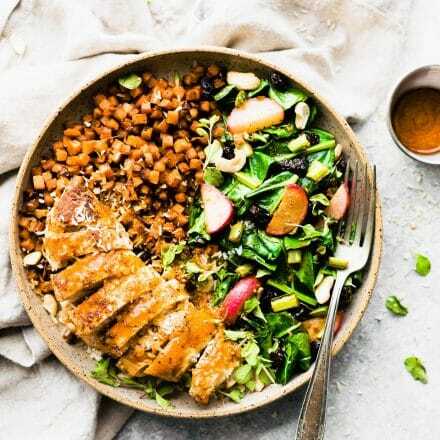 You can easily make this in a roast pan or casserole pan, just skip the stove top and add on an additional 20-25 minutes or so. Check chicken around 35-40 minutes to see progress. Cover for the last half the time with foil so it doesn’t burn. Think of it this way. I’m doing you a favor. You can have your turkey and CHICKEN too! 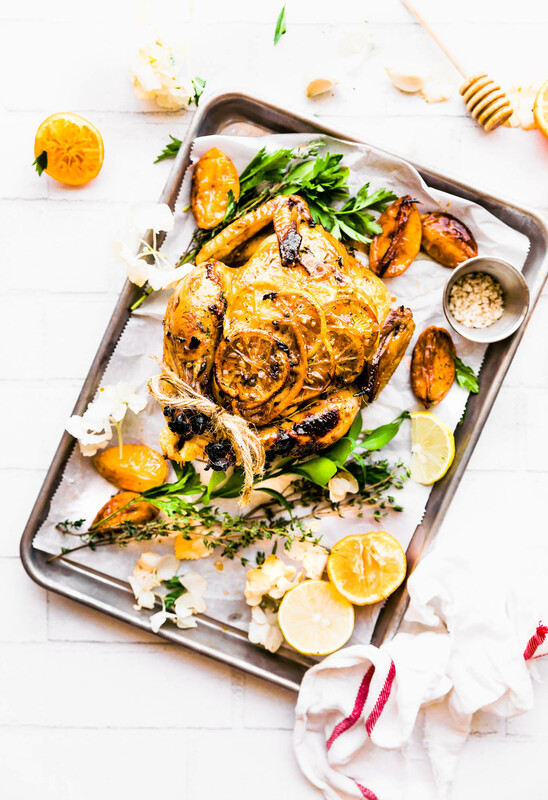 Or you can just save this recipe for post holidays when you are truly sick of turkey. Come one, you know that will happen. 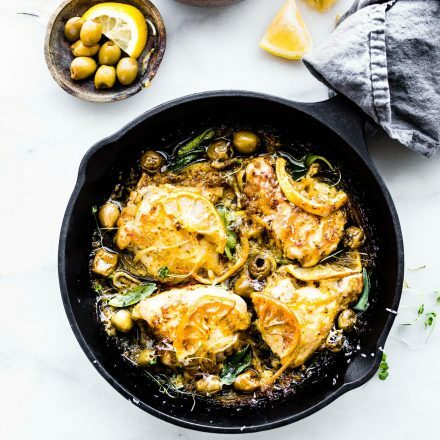 One Pot (or pan) Roasted chicken –> It’s a WIN WIN! Are you a Roasted Chicken or Turkey person? Cast your votes! As I run off hiding… the American who doesn’t like roasted turkey (much). Gulp! For thanksgiving definitely turkey, but roasted chicken is a winter favorite too. And food poisoning on Thanksgiving just sounds heartbreaking because it’s my favorite holiday! No bad memories please! Food poisoning on Thanksgiving? Now that’s rough! I love turkey but I will probably do small turkey breasts on the grill this year. I love the flavor combo in this dish. I bet it would be delicious even on turkey! oh i’d so eat grilled! yea! that i like. Oh, this sounds incredible! I love the sweet-and-savory combo. And you know what? No one will miss the Turkey! I love roasted tureky. And I make it to perfection. Seriously. Confession: my husband cracks up like a little kid if you say the phrase “dutch oven.” Stupid boy. hehe dutch oven. ANd p.s I’ll try your turkey if you eat rice. LOL! Mine too! Every. Single. Time. Turkey and chicken taste almost the same to me (I guess I’m not that picky when it comes to that!). But I LOVE roasted chicken this time of year. Plus it lasts for a bunch of meals. you are so right. I guess there is just a slight difference, right? oh yea! keep me posted! I think you’d love. I knew I’d love this, but now that I’m seeing it I REALLY love it because it’s so simple! Gah–always looking for new chicken marinades and this is a winner. You are not the only one cheating on turkey, Lindsay, we usually make chicken or cornish hens too! 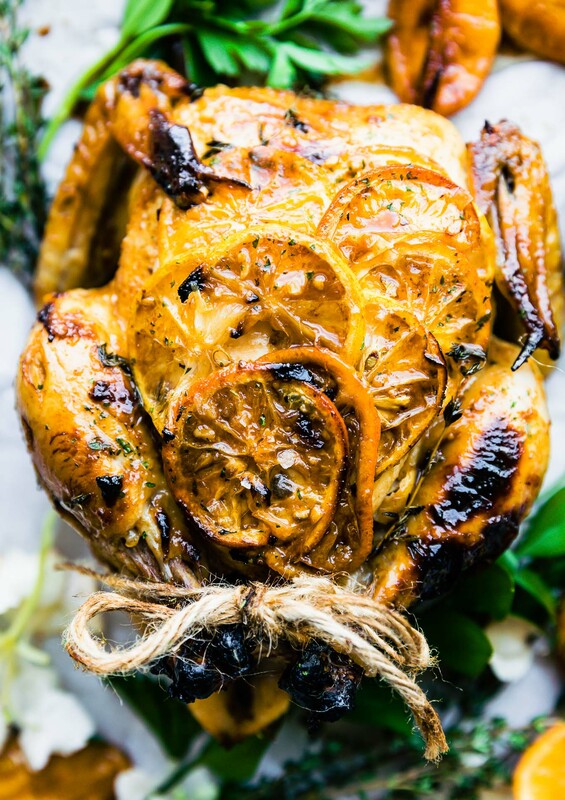 Orange/honey/garlic is such a wonderful combo – I’d pass on the turkey for a piece or two of this! So, my husband loves rotisserie chicken from the store. Instead, I decided to buy some chicken legs/thighs to make at home. I’ve been searching for a good recipe all week and tonight is the night that I’m supposed to be making said chicken legs/thighs. And today, you have the perfect recipe. All I need to do is grab an orange from the store! CANNOT wait to try this! This looks amazing!! And so easy. Hmmm, need to go find myself a dutch oven! you can easily just transfer pot the pot to a pan. NO prob! This looks amazing! I’ve been doing chicken in the crock pot but there is nothing quite as delicious as roasted chicken. 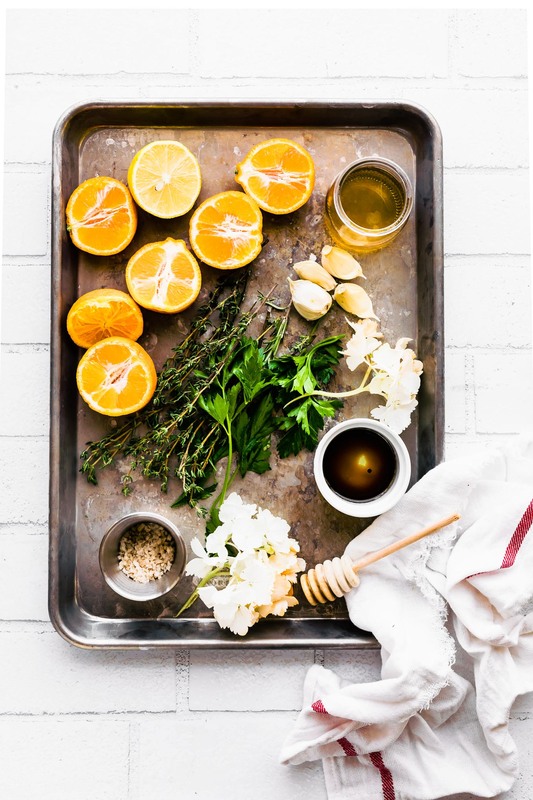 Love the orange honey gralic combo idea! agreed! it’s the extra crispy texture, right? now that is pure genius! i’d eat your chicken any day! love your recipes. FLAVOR BOMB! I’m not a big fan of turkey, either! At Thanksgiving I tend to fill up on the sides, rather than turkey. Looks delish!! sides are where it’s at! Food poisoning on Thanksgiving sounds awful – poor Kiwi! I love roasted turkey on Thanksgiving, but the rest of the year I’m all about roasted chicken and make it a few times a month. This recipe looks delicious! Omg I’m totally making this next weekend! Look out for it on my Menu Plan Monday post! ? Wow, I can’t imagine my life without turkey! Haha. I love the flavor of orange with poultry so I think this is definitely a winning recipe! thats how my husband feels about lamb! haha. P.s. Good to hear from you! I am right there with you – I cant stand turkey. Vegas and I are having steaks. One day I’ll brave roasting a whole chicken, I swear. I make a similar dish with just breast or legs. I haven’t tried doing it for a whole chicken yet.must give it a go!/ yum! let’s just have quiche and call it a day! always good, right? I am with you! I don’t like turkey! But this sounds AMAZING!!! Oooh, Lindsay, the COLOUR on that …! I’m with you on the turkey. I have one word … dry. No dryness in sight here though. Really keen to try this one. It sounds like citrus chicken heaven! Love that you’ve used your dutch oven, too. I struggle with knowing how to get the best use out of mine. I so want to make this, but my chicken is almost 9 pounds! ?. The cooking time would have to be adjusted but I’m lost on that. Help! so I would still cook it the same on the burner, but then adjust in the oven. It will probably need 45 minutes or more. BUt check at 30 minutes to see progress. I would also at least double ingredients. Hope it works! keep me posted! Ok ty! Also forgot to ask, i dont have a Dutch oven, but i have a roaster and stock pot. Would either one suffice in place? Oh gotcha. Okay I would try it all in the oven then. Or a crock pot. Check on it after an hour. I’m assuming it will take longer though. DOes that make sense? It is saved to my files. I also am not a turkey eater. The natural triglycerides in the meat, causes me tremendous migraines. Give me chicken, goose, duck etc and I am a happy camper. I have a terrific goose recipe! Haha I so agree! I love me some duck too! Great minds! I need a goose recipe. Send it my way. YUM! If I wanted to make this with chicken breasts instead of a whole chicken do you know how I would adjust cooking time? It looks delicious! But I’m way to amateur to attempt an entire chicken. Do I keep the lid on the Dutch oven when it’s on the stovetop? Thanks! I kept lid off. Hope it turns out well for you! I have the same confession! Bring on all the fall goodness. Honey and Garlic and Citrus sounds like the very best flavor combo in the whole world for chicken. :))) Drooling. SO moist and flavorful! 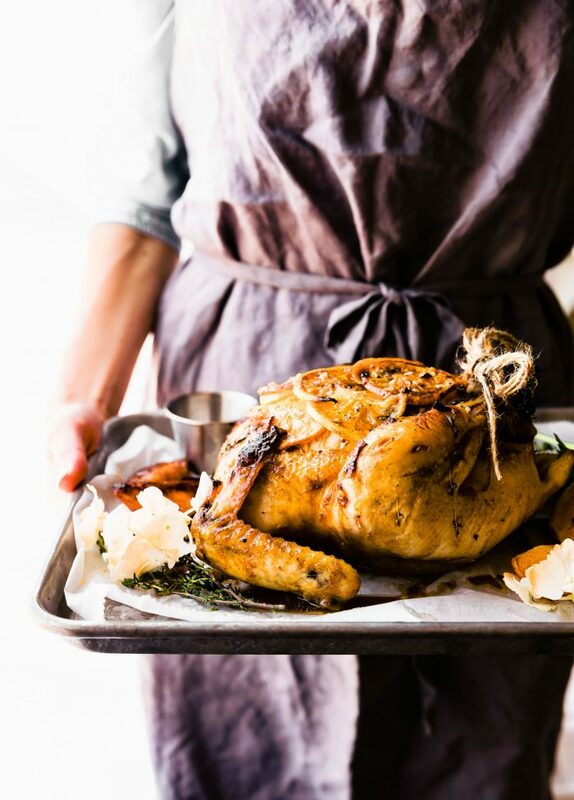 Such a wonderful roast chicken recipe! Why thank you, dear! It’s a good one, for sure. This looks so pretty! I love the orange slices on top! And the savory and sweet mix sounds delicious! Love chicken in every way possible! Since I don’t have a dutch oven, I really like that you’ve included a roasting pan option. Absolutely! Well thanks, it’s my pleasure. Love me a one-pot wonder! 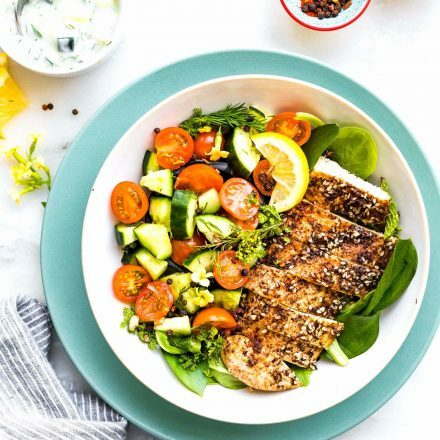 This just looks so amazingly easy and flavor filled!